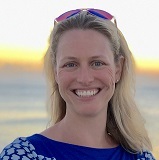 Jennie Harrington, Senior Certifications Manager - MRAG Americas, Inc.
Ms. Harrington has been with MRAG Americas since 2003 and is Senior Manager for the Marine Stewardship Council (MSC) Chain of Custody Certification Program. She has performed hundreds of MSC chain of custody audits, oversees the training and operations of a large team of auditors, and manages the scheduling and review of dozens of audits each month. In addition, she performs confidential second party audits for several consumer-facing organizations that have created internal buying standards, to ensure the robustness and sustainability of their supply chain. She has participated in many fishery and supply chain projects involving the Marine Stewardship Council’s principles and criteria, scientific research, compilation of data from fisheries around the United States, fishery information management systems, independent program reviews and workshop organization, facilitation and documentation. Prior to joining MRAG Americas, Ms. Harrington received a B.A. in Biology and Psychology from Middlebury College in Middlebury, VT and an M.S. in Zoology from the University of New Hampshire, Durham, NH.